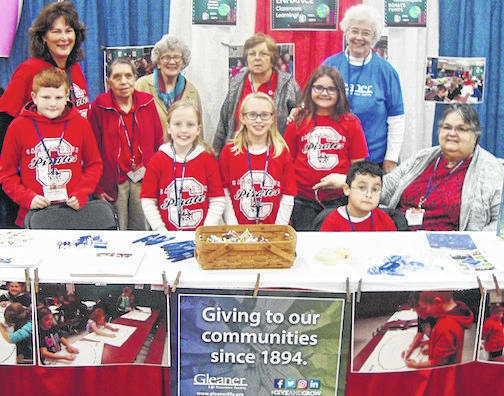 Cardington-Lincoln Third grade students, members of the American Red Cross and Gleaners serving the booth at the Ohio School Board Convention last week. Back row, from left: Dawn Ruehrmund, Nancy Foos, Kitty Halfhill, Rita Barton and Linda Ruehrmund. Front row: Zach Phillips, Candance Fleming, Evy Richardson, Alayna Seavolt,and Lleyton Henthorn and on the right is Marilyn Davis, a member of the Gleaners and the Cardington-Lincoln Board of Education. Five students from the Cardington-Lincoln third grade class of Dawn Ruehrmund were invited to share their Pillowcase Project at the Ohio School Board Association Convention held Monday, Nov. 12 at the Convention Center in Columbus. Theirs was one of 100 projects selected from Ohio schools to show case their response to an emergency situation at their homes. The program on safety in disaster situations was presented earlier to all third grade students at Cardington-Lincoln Elementary School by members of the American Red Cross and Chester Arbor of the Gleaners Fraternal Insurance Society. Ruehrmund then wrote and submitted the application to the Ohio State School Board Association who selected the presenters for the convention. Ruehmrund, Red Cross volunteers and members of Chester Arbor and five third grade students manned the convention booth and answered questions related to each of their programs. Red Cross volunteers shared the free program available to schools to teach students about evacuations in case of an emergency. In addition to answering inquiries from other adults and students about the project, they had the opportunity to see and ask questions on a wide variety of other achievements and projects that were displayed. Students manning the booth were Zach Phllips, Candance Fleming, Evy Richardson, Alayna Seavolt and Lleytin Henthorn, accompanied by Ruehrmund, teacher. Representing the American Red Cross were volunteers Rita Barton and Nancy Foos and Gleaner members helping in the booth were Kitty Halfhill Linda Ruehrmund and Marilyn Davis. Davis is also a member of the Cardington-Lincoln Board of Education.